Hospital group Mediclinic is a core holding in Johannesburg portfolios, and it has not done us any favours lately. It had an absolutely stellar run from 2008 to 2016, as its profitability and market capitalisation soared by ten times. Along the way, it became the dominant player in South Africa, bought its way into the Swiss and UK markets and acquired a London-listing by reversing into the largest Middle Eastern hospital group. Its all-time high share price was around R210. Now it's at R105 per share, and many shareholders feel disillusioned. We feel that the company still has great potential. Long-term demand for Mediclinic's services, across its operating divisions, remains robust, underpinned by inter alia ageing population, growing disease burden and technological innovation. However, the increase in demand across the operating divisions is juxtaposed by lower economic growth in some regions and greater competition. In addition, there is an increased focus on the affordability of delivering healthcare which is resulting in changing care delivery models and greater regulatory oversight. Group revenue was up 4% to GBP 2 870 million, adjusted earnings per share were up 1%, and the dividend payout levels were maintained (total dividend for the year 7.90 pence per share). Operationally, the group is doing fine. It is very good at running hospitals, optimising its capital spend, managing costs and maintaining high occupancy levels. These results were negatively impacted by two non-cash, non-recurring impairment charges. The Swiss-based Hirslanden business revalued some of its assets downwards, and Spire set aside funds for an old malpractice claim. Healthcare policy is an intense battle in every country. Sadly, politicians are usually keen to get involved in this part of the economy. Mediclinic operates in the private sector, so it's looking for patients who have private insurance or savings to pay for world-class care. Regrettably, governments are often not content to just worry themselves about shoddy state-provided care in shoddy state-owned hospitals, they stick their noses into the private industry, trying to regulate prices and outcomes. Leave it to the market mechanism, that's my view! One more point of interest is that the company has a new CEO, Dr Ronnie van der Merwe. He was previously the group Chief Clinical Officer. He takes over from Danie Meintjies, who retires but stays on the board. Given the extent of the assets in Switzerland and the challenges in the UK and Middle East, I would have thought that a European CEO would be a better idea, but we should give Dr van der Merwe a chance. I imagine he won't be spending much time at home in the years ahead. 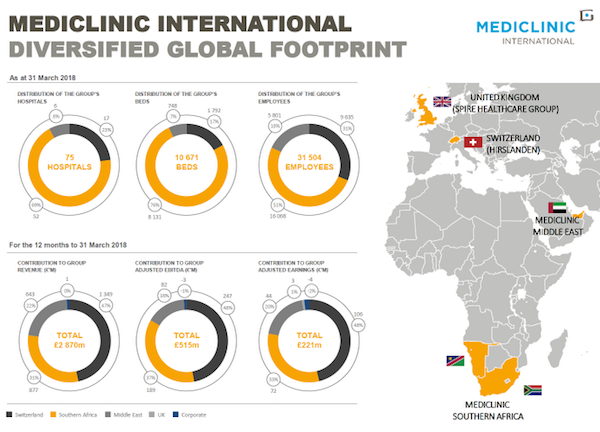 In summary, Mediclinic is well-positioned in a high-growth industry. After a tough period, it's poised for better years ahead.